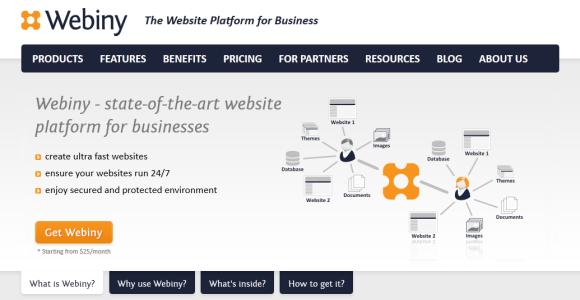 Webiny is a cloud-based tool for building high-traffic enterprise-level websites. Its value proposition is security against hackers: important for any business, but even more so for a web shop. Doesn’t sound disruptive enough? It probably isn’t, but a step up in quality and functionality of website software. Availability of website-making software is no news. For content these are WordPress and co, for e-commerce there are Magento, Shopify or Volusion. To design a generic website you can use Weebly or Yola and add Ecwid widget to start selling or begin with Webs or Moonfruit, and add ecommerce functionality as you go along. One can even create a daily deals business with help of DailyDealBuilder (but this is so 2011). So when I spoke to Croatian Goran Čandrlić, the co-founder of Webiny, I was wondering if there was space left for new ideas in this crowded market segment. Apparently, unlike products aimed at SMEs, Webiny provides enterprise quality. Features that are important for enterprise is website stability, speed of loading, protection against hacker attacks and a necessary back up, all offered by Webiny. According to Čandrlić the technology has been deployed for a website which attracts hundreds of millions monthly users. As far as functionality goes, Webiny is modular, and includes online booking, content management, ecommerce, banner management and email marketing modules to start with. It also allows creating the website in many languages. From the client side the interface looks simple and straight-forward to use. Whilst Webiny boasts enterprise quality, it must be sold in numbers to justify SME pricing. I cannot judge its level of security, I must say that the startup will need a strong marketing muscle to attract attention of the SMEs. Given that the Croatian tech startup ecosystem still lacks its first venture fund, the struggle against the incumbent website builders will be an uphill one. According to Ruslan Fazlyev, the founder and CEO of Ecwid, recently funded by Runa Capital, there are hundreds of PHP-based ecommerce tools. The most popular, freemium-based Magento received a total of $22 million of funding and was sold to eBay for $180 million and now is an important part of X.commerce, which aims to further innovate ecommerce technology. There are however examples of others sailing against the wind: Estonian Edicy, for example, is growing (its differentiator is multilingual website creation, according to Spiegel). Perhaps Webiny founders should just hike up the prices and focus on enterprise clients instead.